Post-postmodern urbanism: plan cities by designing space before mass. This is sometimes described as designing a landscape infrastructure but the word 'infrastructure', as used for roads and underground utilities, implies a stress on the functional aspects of landscape. Users of the term Landscape Urbanism should take care to specify that they are using the word 'landscape' in the special sense it had before it was adopted by geographers. This will provide continuity with design of space by Sixtus V did for Rome, Le Notre did for the Champs Elysee, Nash for London and Olmsted for Boston. 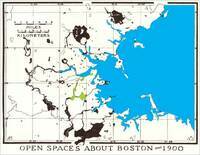 The advance on the work of our predecessors comes from scientific insights of geographers and ecologists. 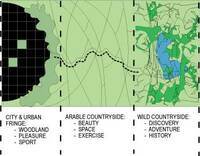 Landscape urbanism is a design approach resting on concepts from the worlds of art and science. The Tuileries garden and the axis of the Champs Elysee are north of the River Seine in the top left corner of this nineteenth century plan of Paris. Baron Haussmann and Louis Napoleon re-planned Paris in the nineteenth century, converting it from a medieval and renaissance city into a baroque city inter-laced with a network of urban avenues - the greatest of which is the avenue of the Champs Elysee. Paris is one of the best examples of a great city designed on the basis of an idea which was born and nurtured in gardens. The first section of the axis, which runs from the Louvre Pyramid to the Place de la Concorde still has a predominantly garden character. The central section, which is the Champs Elysee is a major traffic artery - despite having a landscape name, meaning Elysian Fields. The third section, which runs through La Defense, has the character of an urban landscape design - which it is. The idea of basing urban design on axial planning derives from early Baroque Rome. Pope Sixtus V used the idea in his own villa and then for his plan for Rome. The axial idea was later used for Paris, Washington DC and New Delhi. It is a historic approach to landscape urbanism. The central area of Beijing, comprising the Forbidden City and Beihai Park, was the imperial palace compound. The plan, for landscape and urbanism, derives from a very long history Chinese garden estate planning.